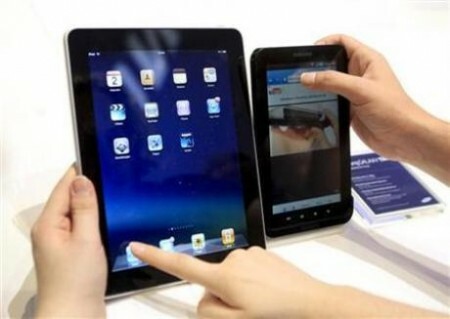 Mobily has released the Samsung Galaxy Tab Android tablet in the Saudi market after an initial delay. The Galaxy Tab is sold for 2,850 SR with 5GB free data plan for 3 months, an offer better than STC’s (2,949 SR with only 250MB for 6 months). Mobily announced the availability of the Samsung Galaxy Tab via an SMS message, the device will be available at the following Mobily showrooms: King Abdullah Road in Riyadh, Altahliya in Jeddah and Aldhahran Road in Alkhobar. Official Arabic support is still missing on Android devices and Google doesn’t allow the Android market to exist in the Middle East for un unknown reason. 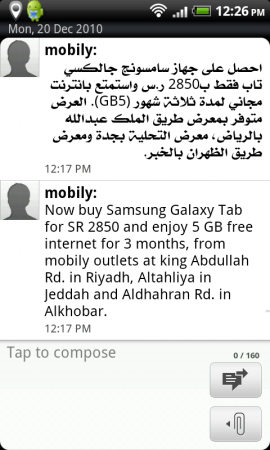 Mobily has yet to announce anything regarding the iPad release in Saudi Arabia. hmm…always thought you were a “mac-er”! anyway, got any comparison going on between Ipad 1.0 / 2.0 and Samsung Galaxy Tab? sure would help me make a decision. i’m leaning towards the galaxy for 4 reasons: portability, long battery life, extra storage and using it as a phone. however, everyone says Ipad is still superior (mainly due to the sheer number of apps and the fact that the screen doesn’t wash out in the sun)…any thoughts?